is unique in bridging the gap between key disciplines critical to the future of nanotechnology in the 21st century. The boundaries between disciplines are fast disappearing, but few textbooks have captured the need for providing students with a spectrum of information across the key areas of science and technology where it is predicted many new developments will take place. 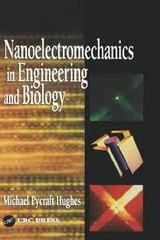 This is at the critical interface between nanoscience, mechanical and electrical/electronic engineering and biology. The many academic institutions that are in the process of setting up truly multidisciplinary departments and research groups will find this timely publication neatly fills what was until now a worrying vacuum."